I’ve been to Ha Giang twice in 2 very different periods of the year. Both times blew my mind! 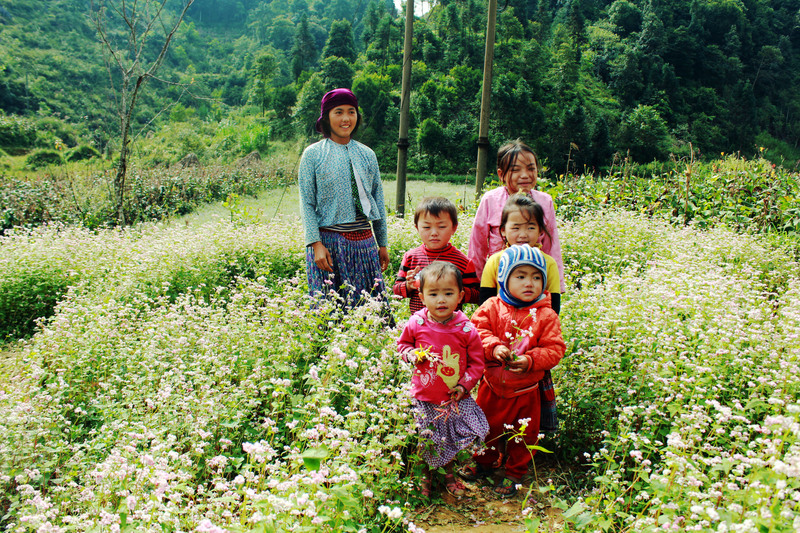 If you’re in Hanoi and wondering whether a trip to Ha Giang is worth it, you HAVE TO read this! 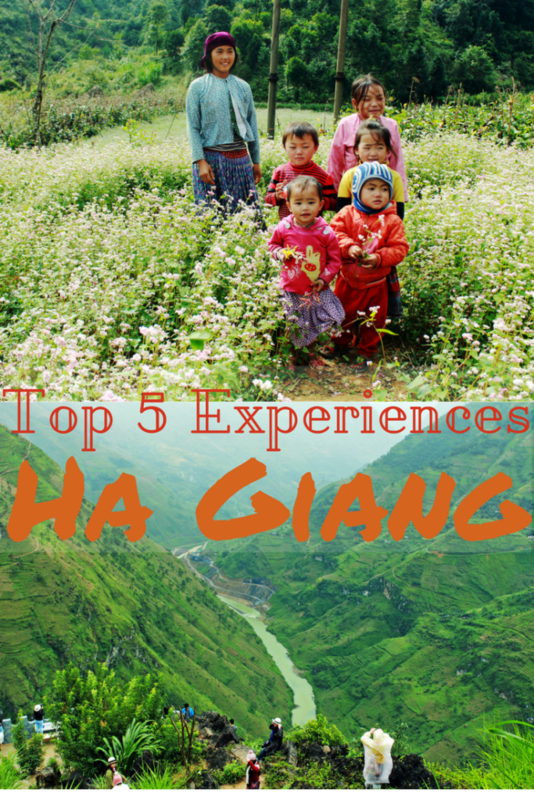 Here are 5 of my best travel experiences in Ha Giang that I am truly excited to share! 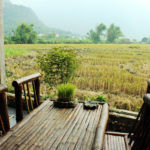 For more information about accommodation in Ha Giang, how to get to Ha Giang from Hanoi, weather in Ha Giang and so on, check out this Complete Ha Giang Travel Guide. Where is Ha Giang in Vietnam? Ha Giang’s location is quite easy to spot on the map of Vietnam. Bordering China, Ha Giang is the northernmost province of Vietnam. Its rough mountainous characteristics combined with its distant location makes Ha Giang one of the poorest provinces in Vietnam. You can find people of different ethnic cultures living here, including the Viet, Tay, Dao and H’mong. 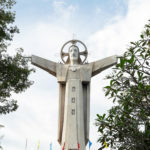 There are 4 districts in Ha Giang (Meo Vac, Dong Van, Yen Minh and Lung Cu), all of which are now connected via a route called the Road of Happiness (I’ll tell you more about it later in this post). The distance between Hanoi to Ha Giang City center is around 300km. 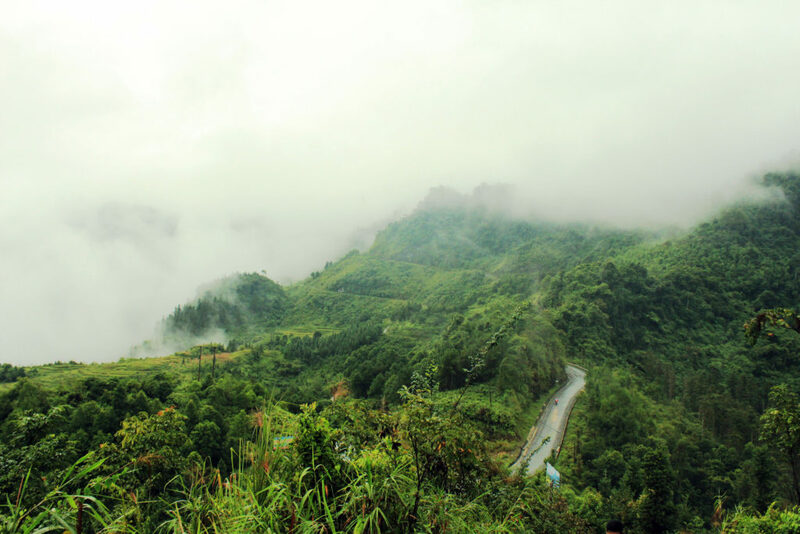 From Ha Giang City, you have to drive for another 160km to reach attractions in Dong Van and Meo Vac districts. 1. Constantly feeling as if I were about to falllllll! Well, it’s not really that bad. But just look at the photo here and you’ll understand what I mean. Can you imagine how it would feel to ride motorbike on these zigzag paths? How about the feeling of sitting behind a local driver’s back with your heart jumping constantly along with adrenaline increase? This is one of the seemingly scary roads leading to Ha Giang. Don’t be discouraged though, because the sceneries along these roads (photos below) are truly STUNNING! 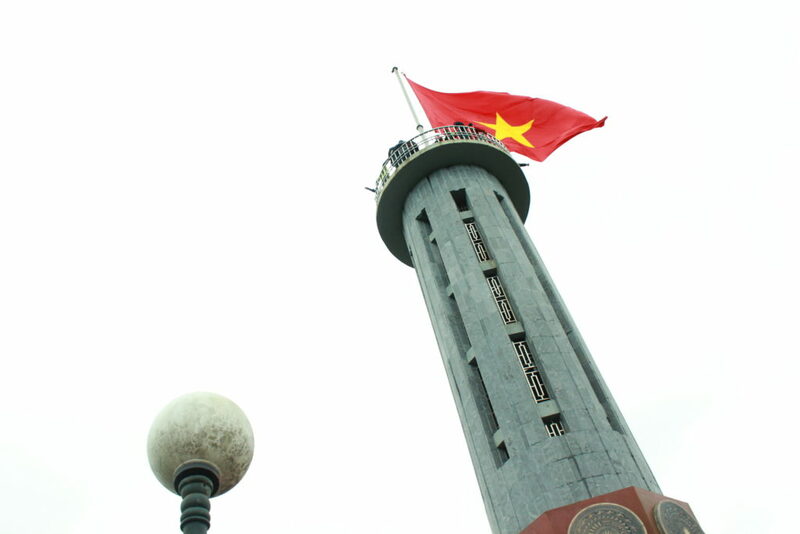 Lung Cu Flag Tower is situated on top of the Dragon Mountain at the height of 1700m above sea level. 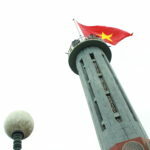 It marks the northernmost point of Vietnam’s territory, overlooking China on the other side. Views from Lung Cu Flag Tower are remarkable with mountains, rice terraced fields and valleys. You can reach the top of the tower after climbing 839 steps. Otherwise, you can hire local xe-om (motorbike taxis) to ride you on the first half of the climb. The generally-agreed price is 40000VND/ person/ roundtrip (as of December 2015). This is also a nice experience as you will be taken via another route with beautiful local sceneries. Tip: The toilets here are unbearably smelly. They seem to never be cleaned. So remember to visit the toilet before you go to Lung Cu Flag :(. 3. Talking to the local children! Unlike ethnic minority children in Sapa, children in Ha Giang are still not accustomed to interacting with tourists. Here you won’t see children selling stuffs on the street or following tourists everywhere. Though I was quite delighted to observe this, I could not help thinking that Ha Giang would ultimately turn into another Sapa, where ethnic minorities lost their cultural values to economic incentives brought about by unthoughtful tourists. For example, many Vietnamese tourists brought candies here and distributed them to these children. In return, they ask for pictures of these “charity efforts” to post on Facebook. 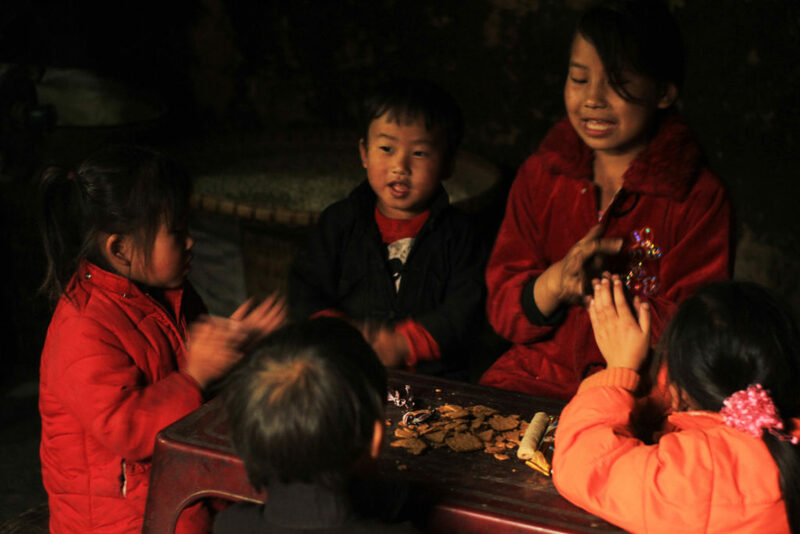 These behaviours have caused ethnic minority children in Sapa to expect and even proactively ask for gifts from tourists. Fake love markets also take place in Sapa as a result, with the aim of asking for tourists’ money. Part of the Dong Van Karst Plateau, Ma Pi Leng Pass runs for 20 km across the Ma Pi Leng Mountain Top (1200m). 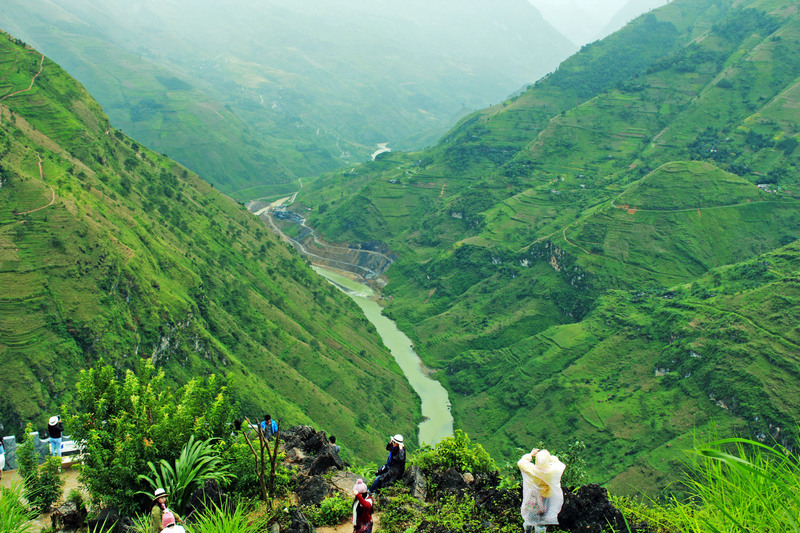 The Pass lies on The Road of Happiness, which connects Ha Giang City, Dong Van and Meo Vac. Thousands of volunteers from 16 ethnic groups in North Vietnam built this amazing road in 6 years. Once you have seen the geographic characteristics of this area and its crazily dangerous mountainous location, you will understand why the road’s name is Happiness. Having ridden twice on this road, I could not help thinking about the courageous efforts and sacrifices of all those volunteers. Without them, our generation couldn’t have had the privilege of riding here so conveniently. There’s a viewing station on The Road of Happiness where you can view the whole landscape of Ma Pi Leng. I know you are feeling in awe while looking at this picture. But trust me, neither words nor photos can beat the awesome experience of standing there physically among those awe-inspiring mountains. Organized on the 27th of March (Lunar Calendar) every year, Khau Vai Love Market is originally the gathering place for those who fell in love but for some reasons could not be together. According to the old tale of the local ethnic minorities, there was once a couple whose families objected to their marriage because they belonged to different ethnic groups. While secretly dating on top of the Khau Vai Mountain, they saw their families fighting with each other. In fear of more tragical consequences, they miserably departed. However, they promised to meet once a year on the 27th of March here on top of the Khau Vai Mountain. The Khau Vai Love Market therefore became the annual meeting place for all those who could not continue with their relationship, even after they had got married to somebody else. What I found interesting about this market is that no jealousy would be involved on this day. If a person’s wife asks to join the market to meet her ex, the husband will show his trust by allowing her to go without being jealous, and vice versa. The person who joins the market will also show respect towards their spouse by not doing anything beyond the line of friendship with their ex. Khau Vai Market is now more than an Ex-Lover Market. Young people also gather here to find new lovers. Cultural activities such as musical performances also take place. 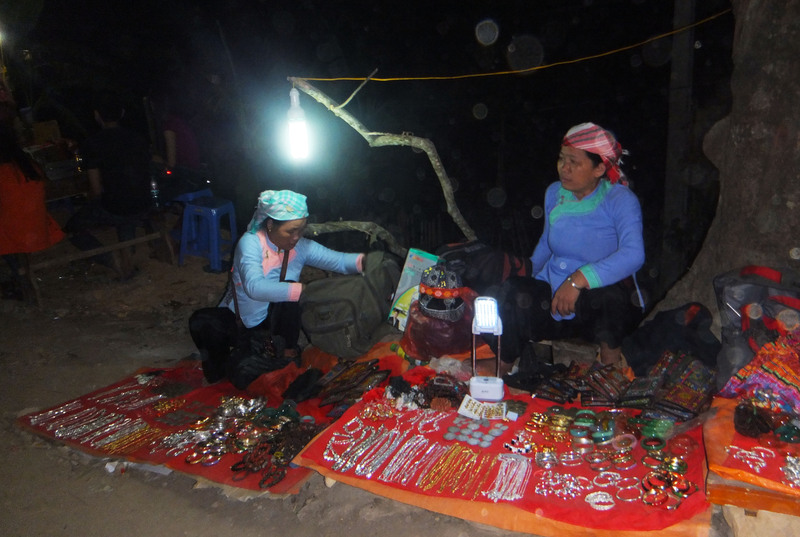 In fact, tourism has developed Khau Vai Market to become a more fun and diverse event for visitors. Yet the market is still fortunately very little affected by commercial and staged authenticity like in Sapa. When visiting the market, you will see couples standing in various corners around the mountains and other larger groups drinking and laughing excitedly. All are very natural. Note: It is absolutely inappropriate to take photos of locals in Khau Vai Market when they are meeting in private with each other. I encourage you all to be just normal visitors. Do participate in activities such as watching dance performances, playing traditional games and buying specialities. Yet don’t interfere with the locals’ personal affairs. 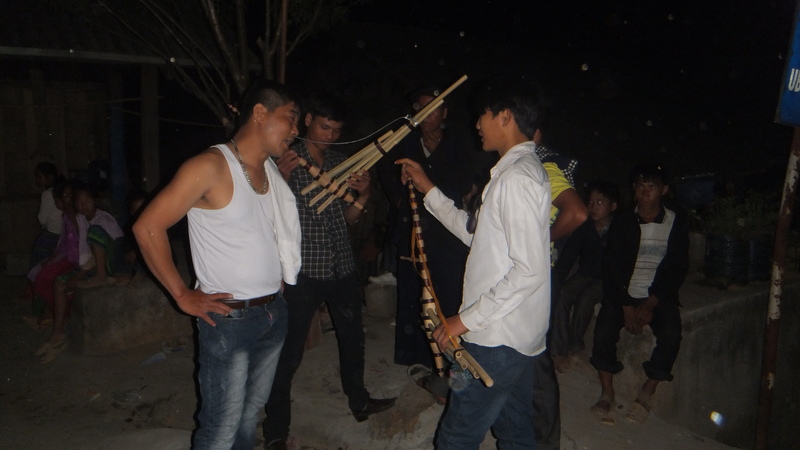 Local men playing a traditional musical instrument in Khau Vai Market. So, what do you think? I’d to see YOUR list of amazing travel experiences in Ha Giang next time! 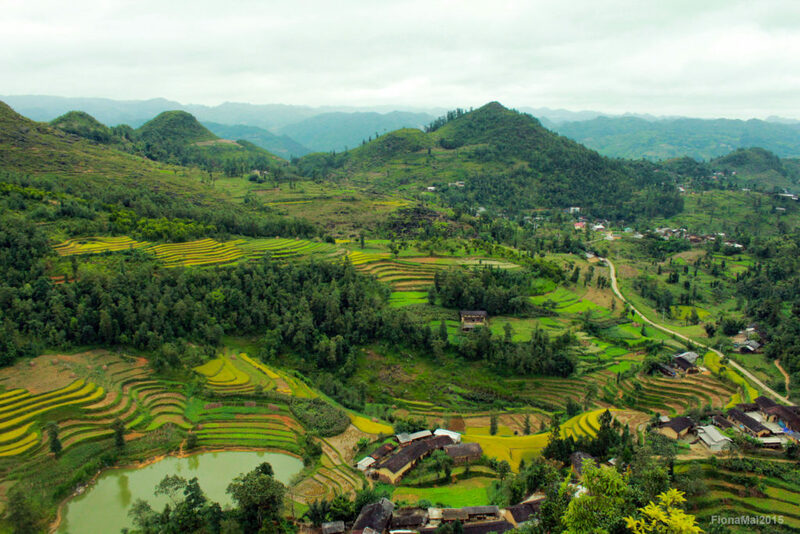 This complete Ha Giang travel guide covers everything you will need to know about travelling to Ha Giang, from accommodation, route, attractions to itinerary. I’ll make sure to update it regularly as well! See which attractions in Ha Giang you should visit to plan your trip better. I hope you will also feel inspired with my blog posts about Pu Luong, Ta Xua and Quy Nhon, all of which are also amazing off-the-beaten-track destinations in Vietnam. The zigzag roads in that heavy mist and fog look beautiful as well as dangerous. What a landscape that it. I love driving, and that too amidst the mountains. Must make a note of the places you mention here. 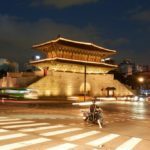 Beautiful post and as I read more about Vietnam, the more I am wanting to visit it. The photographs are amazing and the greenery is just spectacular not to mention the winding roads that I bet as you said can be scary when on a bike/scooter. Especially loved the photos of the locals with their smiles. I have to say your ‘people photography’ is amazing, the baby is so cute and I love his hat! How did you get up there? by motorbike taxi? The road does look very slippy. The views from the tower and also driving up there are amazing, worth the trip alone, I wonder what it would have been like on a sunny day. Thank you for your comment. We went there by bus, car and also motorbike. The views along the roads are spectacular and my photos can’t capture enough of their beauty:) And yes the locals are the best ambassadors of this wonderful town! I still haven’t made it to Vietnam but it’s one of my top destinations to go to. There’s just so many places to see and things to do there that it seems endless! The natural beauty looks very stunning and well-preserved! I’m not sure I’d drive/motorbike on the zigzag road in the fog, but if someone drives me, I’ll just enjoy the scenery! Vietnam is so beautiful… always wanted to visit the country and especially Halong Bay. Hopefully next year for sure. Thanks for sharing other offbeat and beautiful places to my list. Ma Pi Leng Pass looks amazing. The scenery and view from the flag tower is just incredible! Sooo green! It really saddens me when I see so many children being used as pawns in the “make money off of tourists” game. Let children be children, right? So glad that not all of these children have been influenced in that way just yet, and here’s hoping they never do! I am heading to Vietnam for the first time in May and I’m super excitedZ I only have six days though so I don’t think I will be able to get to Ha Giang this time. The good news is that Jetstar will start flying Sydney – HCMC direct in May which should make it a lot more affordable to get to Vietnam so I can go back! Hi Fiona, Ha Giang looks lovely. I’ve never been to Vietnam but I’d like to go one day. I’m from Scotland and I’m a keen hill-walker, and Ha Giang looks like good hill-walking country. Nice post and good pics. Good luck! Ha Giang sounds amazing! I didn’t even know that this place existed. I originally wanted to visit Sapa when I was in Northern Vietnam, but the roads were too icy and snowy to be traveled so I had to skip it. I would like to go back and now I will swap Sapa for Ha Giang. I had never heard of Ha Giant but it looks enchanting! will definitely bookmark this for our next trip to Vietnam, thanks for sharing! I’ve always wanted to visit the area of Vietnam bordering China. I’ve heard/seen photos of these amazing waterfalls that sit on the border (have you been or heard of that before?). Thanks for sharing all this info and I can definitely see how you feel like you’re about to fall all the time 😮 Also thanks for the heads up about the toilet! I find putting Vicks Vapour Rub under my nose helps me cope with bad smells. Motorbiking from Nha Trang to Hoi An sounds so cool! I love that route as well with mountains on one side and the sea on the other. The waterfalls you mentioned are called Ban Gioc. They’re located in Northeast Vietnam, in Cao Bang province. I’ve been there as well and yes they’re truly amazing. If you have a chance to ride motorbike in North Vietnam, especially in those mountainous areas, I bet you’ll absolutely love it! Thanks for your comment and hope you’ll have a chance to go back to Vietnam! That is so interesting about the Love Market – the history makes perfect sense, but what I found more surprising is the custom of even married people coming back to this place and meeting their exes. I’ve never heard of Ha Giang before but would love to visit. Will have to check and see if I can squeeze it in on my upcoming trip to Vietnam. 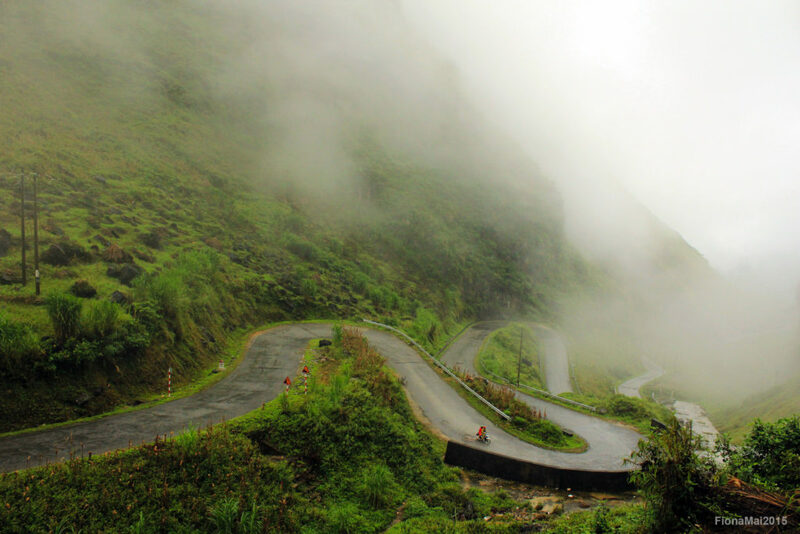 I love your photo of the zig zag road btw – it makes Ha Giang look like a mystical city! OMG It looks beautiful although I think I might get a bit sick on the zig zag road lol. I am going to Hanoi in March I have 3 spare nights after a tour do you think its possible to go here for a day trip or is it a bit too far. If it is too far I will definitely try and get back another time to go here as it looks so pretty. Ha Giang is so gorgeous. It has some of the best landscapes in Vietnam. Those windy mountain roads are scary but also so attractive. Thanks for these great tips. We’l be visiting the area soon. That was such an informative post. I haven’t even heard of Ha Giang, but would definitely try to go there when I go to Vietnam. I love the mountain views and the rice terraces. The tower looking into China sounds awesome too! I wonder if there is any hiking in the mountains? 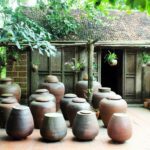 This is a gorgeous region of Vietnam – one I am sad to say I was totally unaware of until this post. 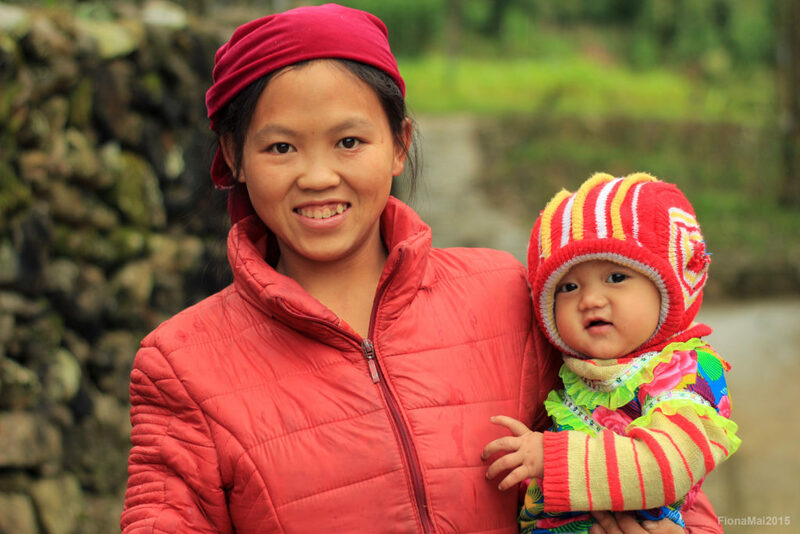 I appreciate that the children are not yet used to interacting with tourist and have the same fears as you, that Ha Giang will ultimately end up like Sapa – although I will keep my fingers crossed it doesn’t! I’ll be in Vietnam soon enough so I am definitely keen on visiting Ha Giang while I’m there. It looks gorgeous. It’s a shame that some travellers are being irresponsible with their treatment of the locals but hopefully socially aware travellers won’t do that. You are one stgihratforward writer. I enjoyed reading your article and taking in all the interesting information. I share your thoughts on many points in this content. This is great. Vietnam is a country with captivating scenery and majestic monuments of time gone by. Viet nam country fully reflects the contrasts with bustling, vibrant cities. Whereas, peaceful and quaint rural villages where time seems to have stood still. Enjoy two weeks Vietnam adventure tours to explore fascinating country by your own way. Without a doubt, cycling is definitely one of the brilliant way to explore the alluring country, experiencing excited activities, and enjoy outstanding natural scenery. Admire picturesque outcrops Limestone Mountains in the North Vietnam. Tasting fresh seafood in oriental architecture restaurant. Cyclist will conquer one of the maverlous passes on the way whilst admiring breathtaking rice terrace on hillsides. Join in colorful hill tribes market to understand their living. Our cycling trip will start in Hanoi – the capital of Vietnam. 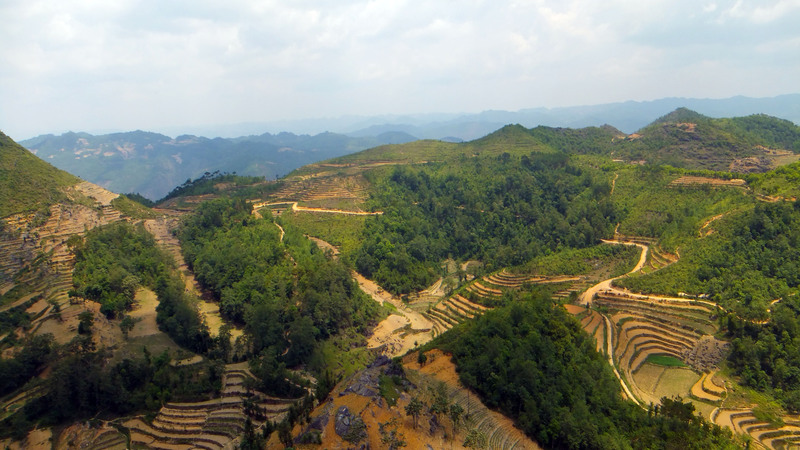 We set off our journey to Thai Nguyen – Ba Be – Cao Bang frontier province and cycle along the border line between Vietnam and China to Ha Giang. Crossing Ly Bon Bridge to cycle on Happiness road and conquer magnificent Ma Phi Lang Pass to uncover outstanding limestone mountain panoramas, descending to – Dong Van karst plateau Geopark, Lung Cu flagpole to expose the spectacular scenery, visit untouched regions, meet and talk with curious people on the way or visit their family to learn their culture. We enjoy breathtaking scenery whilst riding through scenic route Hoang Su phi to Bac Ha – typically colorful hill tribes market. We also ride on village road and buffalo trail to amazing Thac Ba Lake, staying in Homestay and exploring stunning scenic beauty around the lake. Do you want a challenging but interesting Vietnam northeast cycling adventure? Do you want to have a Vietnam mountain cycling holiday which filled with wonderful and spectacular memories and moments? IET Cycling Tour introduces the cycling tour of North East Vietnam that is the great choice for those who look for the special challenging biking tour and are interested in geographical and cultural wonders. This is the wonderful cycling path of Vietnam mountain bike tour will pass through the remote north areas of Vietnam in which you can have the great enjoying the sightseeing of natural landscape, Mountainous and opportunities to understand and experience the daily activities, custom, traditions as well as culture of ethnic minority groups living in plateaus and mountainous areas like Zao, H’mong, Nung, Tho, Thai, Tay.Taking part in Bicycle tours of North East Vietnam, you can have chances to explore the beautiful parts of Vietnam in northeast. On the last 2 days before end of Vietnam northeast cycling adventure, Extension we have two days relax and visit the Halong bay by the Junk boad cruise. It is the wooden junk boat with the modeled on traditional Vietnamese sailing boats. Join with Indochina cycling tour for this cycling holiday. It is promised to be the most spectacular strips and you will have a amazing biking holiday in Vietnam. I’ll be in vietnam next April, and Ha Giang become one of my destination. Thank you for your information, Fiona. You’re very welcome! I hope you’ll enjoy the trip!